Liane Jollon, right, executive director of San Juan Basin Public Health, looks over a 1950’s photo on Thursday with Mary Ruth Bowman, 98, a long-time health educator and nurse in Durango, to see who she might recognize in the SJBPH photo, SJBH set up in the Durango Public Library celebrating 70 years of providing public health in the Southwest. National Public Health Week kicks off on Monday. 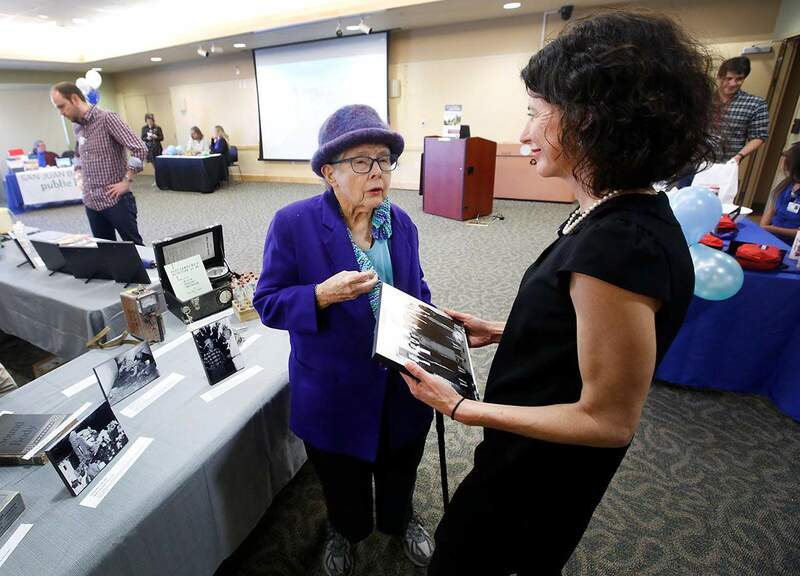 To mark the occasion and 70 years of working to protect human and environmental health, and inspire well-being in the communities they serve, San Juan Basin Public Health staff threw a party Thursday afternoon at the Durango Public Library. Surrounded by community members and health and human service agency partners, staff at our local public health agency, serving La Plata and Archuleta counties, reflected on “then and now, 1948-2018” and 70 years of accomplishments. The agency, which has quietly gone about its work delivering traditional public health services such as immunizations and restaurant inspections, has evolved with the times. Today, they are responding to modern-day health challenges such as positive youth development and suicide prevention. Since protecting water quality is a core part of their environmental health mission, the agency came more into the public eye in August 2015 with the Gold King Mine spill. Preparing for public health emergencies is also within their mission. The agency was among the first on scene and has remained a vital partner in efforts to clean up the river and work on prevention, what they do best. And it wasn’t the first time. As they did with the Gold King spill, 60 years earlier in 1956, the agency coordinated with the La Plata County Sheriff’s Office to notify downstream communities of a 3,000-gallon sulphuric acid spill into the Animas River. In January, the agency adopted new regulations for managing on-site wastewater treatment systems, also known as septic-systems, the benefits of which – reducing the risk of disease and pollution of drinking and surface water – extend well beyond the individual property owner to the entire community and watershed. The agency is currently soliciting public input into an update of its community health assessment reviewed every five years to identify community priorities and the issues residents believe the agency should be addressing. The survey, available in both English and Spanish, is online at sjbpublichealth.org/apc. Paper copies can be obtained by calling 247-5702. To learn more about the work of San Juan Basin Public Health and to take advantage of its services, visit sjbpublichealth.org.